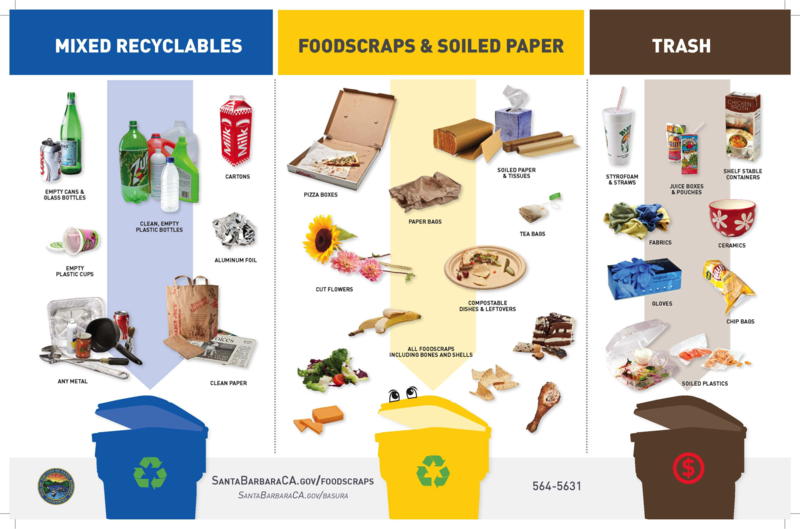 Reduce your waste that goes to landfills by participating in Santa Barbara County’s recycling and composting programs. In order to qualify for Green Business recognition, businesses must cooperate with the County’s goals by setting up recycling and composting programs. As a result of these programs, the County of Santa Barbara has attained a 73 percent waste diversion rate, thereby meeting the dual goal of conserving resources and reducing the amount of waste that goes to area landfills. Santa Barbara County’s three-bin waste collection system is designed to make recycling easier, while reducing the amount of waste that is sent to landfills. It is easier to sort your recyclables by combining all bottles, cans, and paper in the blue bin. The green bin is for all green waste items, such as weeds and yard trimmings. Anything that goes in the brown bin is sent to landfill, but remember that hardly anything truly belongs in the brown bin. If you do not currently have service or would like to request change in service levels call MarBorg, 805-963-1852, or Waste Management/Health Sanitation Service (HSS), 805-922-9092, depending on your location in the County to arrange for service. For information on setting up waste diversion programs and to learn about the cost savings achieved through waste diversion, visit the County’s website for the Resource Recovery and Waste Management Division at LessIsMore.org. Training – Conduct regular trainings for your staff on materials that belong in each bin. Sendelectronic reminders to your staff on items that (you find) are often placed in the wrong bin (such as coffee cup sleeves, soiled napkins etc). 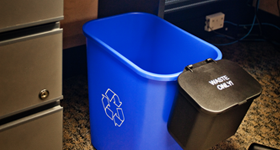 Signage – Use signage to educate staff about materials that belong in each bin. Visit our Downloadable Signage for some samples to print out and use in your business. 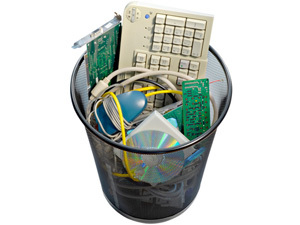 Disposal Strategies for items that do not belong in the 3 bins– Collect batteries, electronics, fluorescent lights, plastic bags, and/or scrap metal for proper disposal with a small, well-marked bin near the waste stations. Use LessIsMore.org to find out how to dispose of these and other items. For free technical assistance or information on how to start your program please contact SBC Resource Recovery and Waste Management at 805-882-3616.